Outdoor Grilling company specializes in catering fresh cooked food. 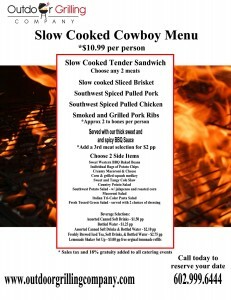 Other than our slow cooked BBQ meats, everything is cooked on site fresh in front of your guests. Our set up is professional and clean with the right equipment to prepare your food, but will also keep your food at safe temperatures for serving during your event. 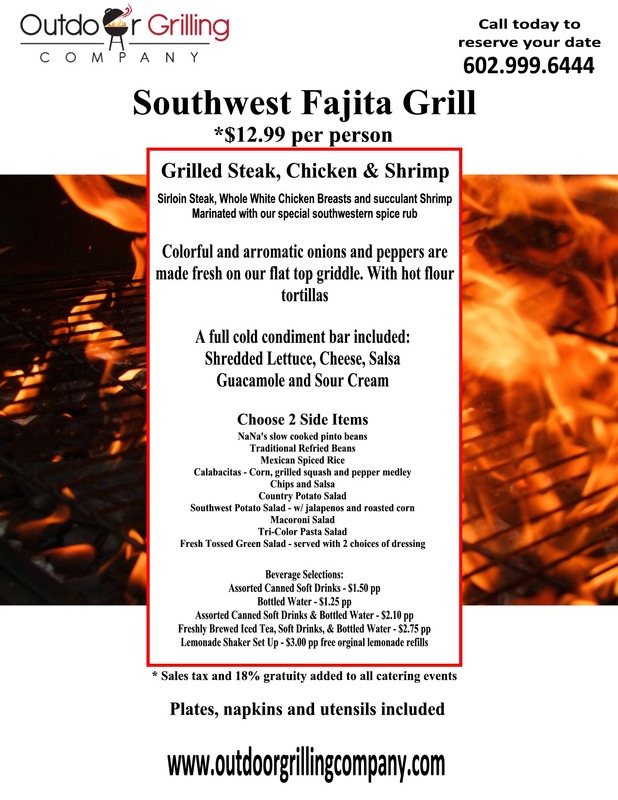 Below is a sample of our most popular menus. 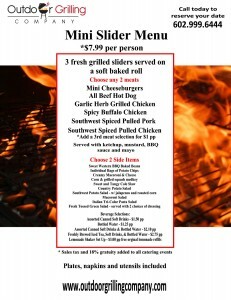 We are a small family owned business and are willing to work with you and create a menu to fit your needs and budget. So if you don’t see something you want or you want to mix and match up menu items, we are more than willing to accommodate your needs. All of our fresh grilled caterings include plates, napkins and utensils. 2 hours of serving time. Minimum of 40 people for full service on site grilling and serving. Please call for details for our delivery drop off service for smaller parties. 1/3 lb hamburgers or garlic herb chicken & jumbo all beef hot dogs grilled on site. Served on fresh buns with all the traditional condiments. Choose 2 delicious side dishes. Click menu for more details. A big hit for kids and adults at your event. Grilled fresh on site and served with soft white rolls. 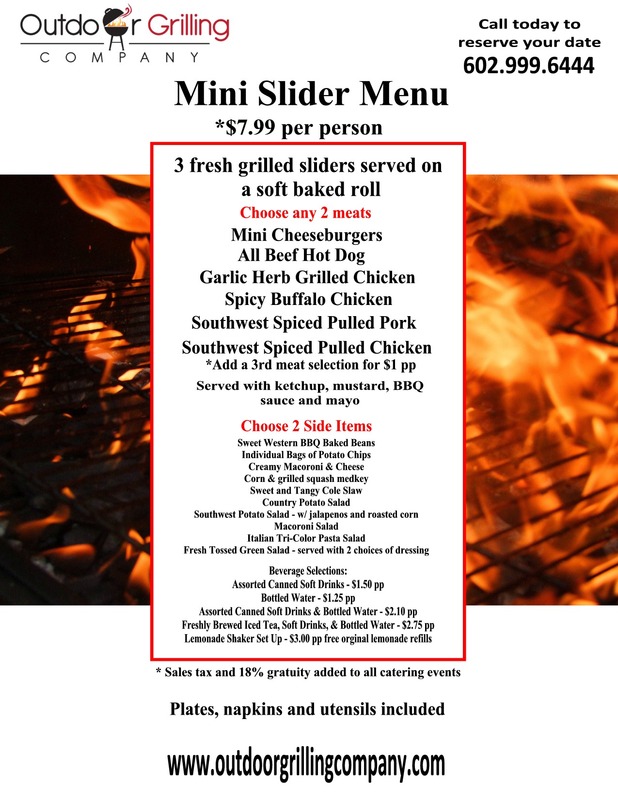 Choose 2 meats: Mini cheeseburgers, all beef hot dogs, garlic herb chicken, spicy buffalo chicken or Southwest pulled pork or chicken. Choose 2 delicious side dishes. Click menu for more details. This is an OGC favorite dish and one of our most popular choices. Slow cooked pork in New Mexico Chile and spices. We can make it hot or mild and you get both red and green chile. Served with flour tortillas hot off the griddle. Choose 2 delicious side dishes. Click menu for more details. Meats cooked slow and low until fork tender. 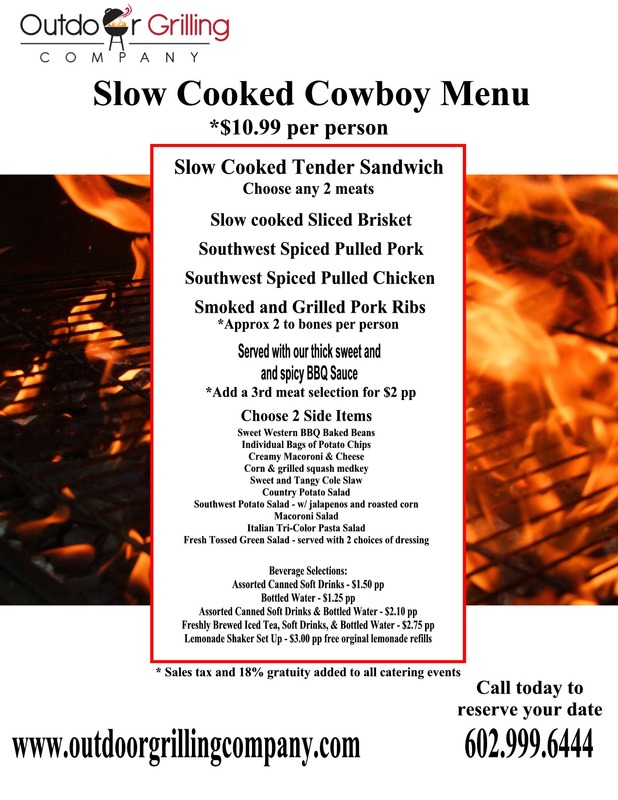 Choose 2 meats: Southwest Pulled Pork, Southwest Pulled Chicken, Sliced brisket or smoked and grilled Pork Ribs. Choose 2 delicious side dishes. Click menu for more details. High quality meats marinated in southwest spices and grilled fresh on site with all your favorite toppings. Choose 2 meats: Southwest Sirloin Steak, Soouthwest Chicken or Garlic Herb Shrimp. Choose 2 delicious side dishes. Click menu for more details. © 2019 Outdoor Grilling Company. All Rights Reserved.